Senior's are aged from 17+ years old. Junior's are aged between 10-16 years old. Small Fry's are aged between 0-9 years old. Memberships not renewed by 31st July will be deemed to have lapsed. Rejoining the club will therefore require the payment of the appropriate fee. You are an existing member renewing prior to the 31st July. I hearby apply to become a member of the Batemans Bay Game Fishing Club inc. In the event of my admission as a member, I agree to be bound by the rules of the association at all times. I as a financial Member of the Association, Nominate the above applicant. They are personally known to us to be of good character for Membership to our Association. 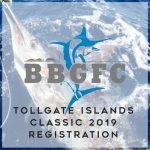 If you are a skipper please fill out the Boat Rego form in the 'Online Registration' page.